The great thing about Melbourne Fringe is the sheer range of shows on display and one that promises a unique experience is Lost In The Looping Glass. Created by violinist and sound artist Helen Bower in collaboration with composer Charles MacInnes, this is a unique musical show not to be missed. An exciting sequel to Bower’s 2014 fringe show Through the Looping Glass, this new work delves deeper into the fascinating new music that can be created with just one violin, a loop station and some well-placed sonic effects. "Looping is taking a fragment of music (a melody or a chord sequence of a rhythm for example) and making it go round and round - a bit like having a song on repeat, once it gets to the end it starts again at the beginning," Bower explains. "Live electronic looping is when you record those fragments live and then loop them and layer them on top of one another to create a piece of music. It's a really fascinating way to create rich and interesting textures with just a single instrument." "I was keen to explore looping and so I took the plunge and got my first loop station. After playing around with it for a few months I decided I wanted to push my boundaries and really explore what the loop station could do in terms of classical music. So I reached out to a few composers and asked if they were interested in writing a piece for solo violin and loop station. The result was last year's fringe show Through the Looping Glass and I was so happy that the audiences seemed to love the music as much as I do," Bower says. She has since taken the show across the country and hopefully heading over to New Zealand in 2016. "With Through the Looping Glass, I am further exploring the world we created in the original show, really trying to look more closely at the sounds we found there," Bower says. "There is of course lots of trial and error and sometimes some happy mistakes! 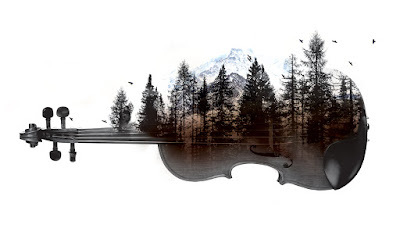 I love how having the violin plugged into the loop station really picks up some of the sounds that we might sometimes want to eliminate, and we can then use them to create parts of the music." Bower performed at a recent event in which I attended and her music had me transfixed so I'm quite looking forward to seeing her perform in a full-length show. Lost in the Looping Glass is guaranteed to be a captivating performance with sounds, rhythms and melodic lines unraveling and evolving to reveal a multitude of different sound worlds, all within the confines of a North Melbourne warehouse. "I hope that when people walk away from Lost in the Looping Glass, they feel that for 50 minutes, they had the opportunity to just sit and listen and let the music take them away from the day they've had and transport them to whatever worlds their imaginations conjure up," she says. "That's what I'm lucky enough to experience each time I play, so I would love to share that experience with others - I really do think it's pretty magical."